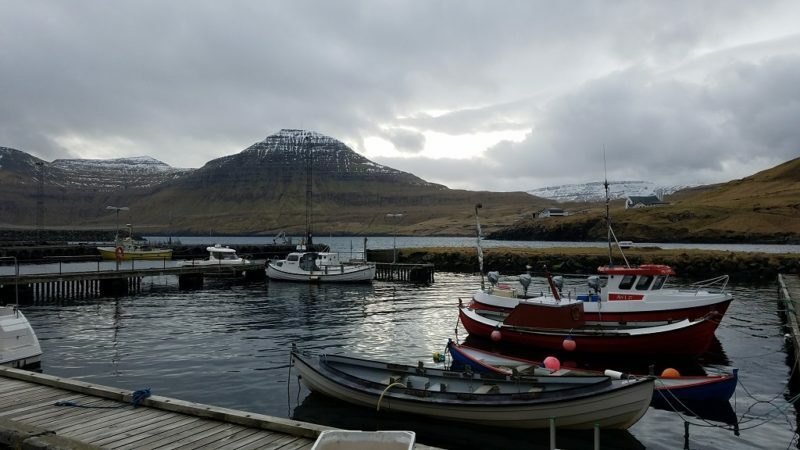 An archipelago of eighteen islands between Iceland and England, with strong political ties to Denmark, the Faroe Islands charmed me through and through. 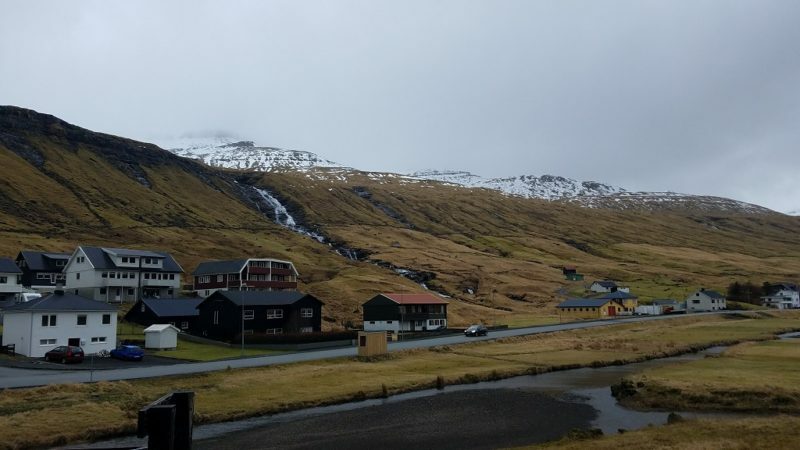 The steep snow dusted mountains, the countless roaming sheep, the candy cane colored homes, the Faroese people, the strong relationship to the wind and water. 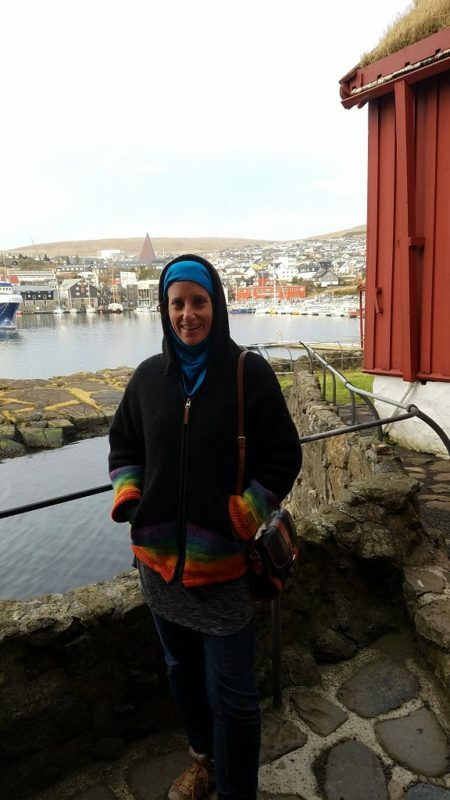 I found that the Faroe Islands were full of sweet, if chilly moments. If you are making a side trip from another country through Atlantic Airways, you will need to choose your days carefully. Atlantic has daily flights from Copenhagen and its other routes fly one, two or three times a week year-round. And you might also check SAS, which also serves the Faroes. I flew from Iceland on Atlantic, which has flight options that allow for visits of three or four nights. Having presumed the Faroes would be special, I went with four nights. The entire country has 50,000 people. The capital, Tórshavn has 20,000 residents. 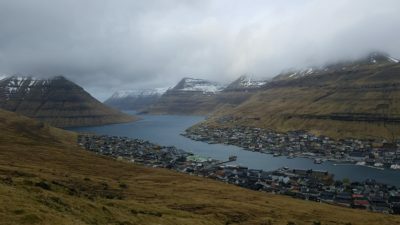 The second biggest town, Klaksvik has 5,000. The other 25,000 are scattered throughout what is the most remote place I have ever visited. Because there is such a small population, I had to keep reminding myself I was in an entire other country! 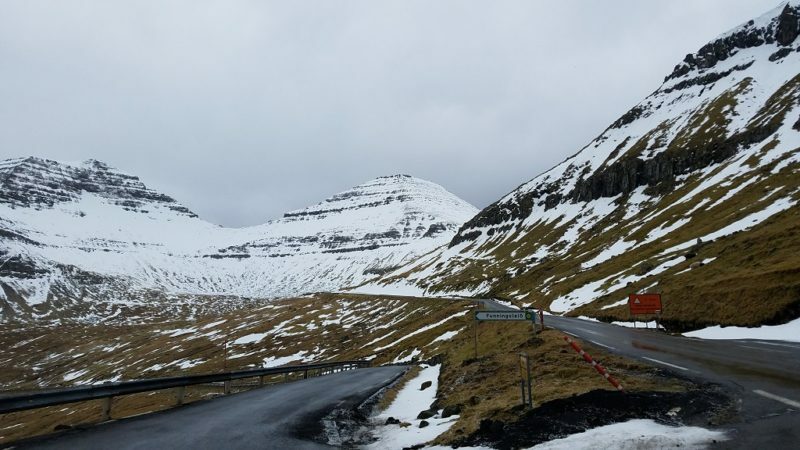 Lots of Ways to Explore the Faroes – Infrastructure Is Awesome! Unless you truly want to get away from all traces of humanity, consider Tórshavn your base. It is on the southern end of Streymoy. Instead of spending an entire day in Tórshavn, I think checking it out a couple hours a day is best. That way, you can make the focus of the day getting to another island. For a country of its size, the public transportation is totally dialed in. This provides lots of options for where to visit. You can use the free public buses, the paid private buses, and the ferry. Also, you should consider renting a car for a day, if you want more flexibility. Once you arrive in a village, everything in compact and you can get around easily on foot. 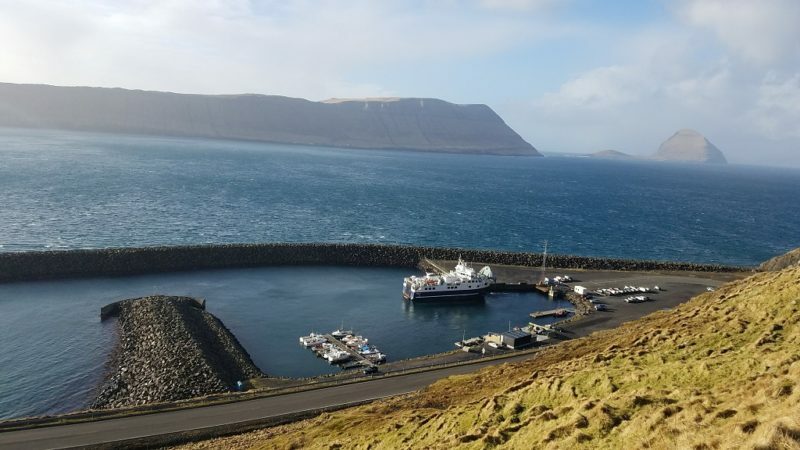 On your ferry day, you can visit the island of Nólsoy, Hestur, Sandoy or Suouroy. Sandoy and Suoroy are part of the Southern Islands and the ferry rides are longer. I would consider this for a summer visit when longer days are on your side. A visit to these two would truly be off the beaten path. With shorter days, it is more sensical to spend less time traveling, so you have more time for exploring. 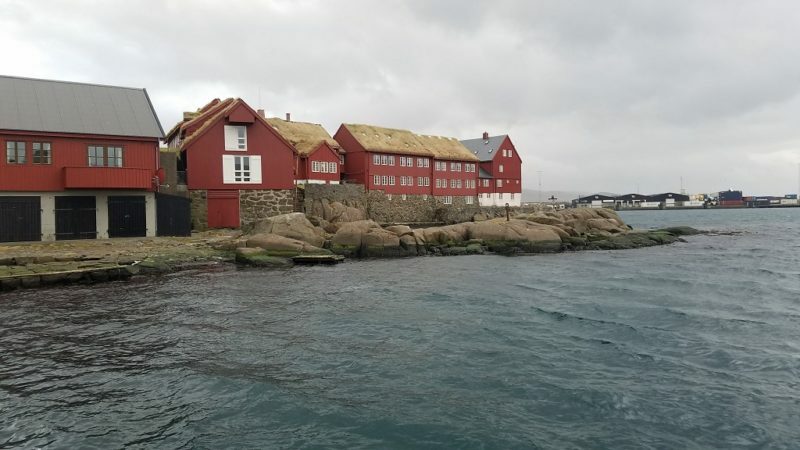 Hestur can be reached by the ferry from Gamlarett, which is about a 20-minute drive west of Tórshavn. Although I did not go out to Hestur, I did the drive to Gamlarett on a bus en route to somewhere else. And the ride was worth it just for the views of the other islands. Just north of Hestur, the island of Koltur stands on its own. It actually can be accessed only through helicopter. It is amazing to think that only one family lives on Koltur! But it’s true, and this is exactly the type of thing you think about when you get out to these places. 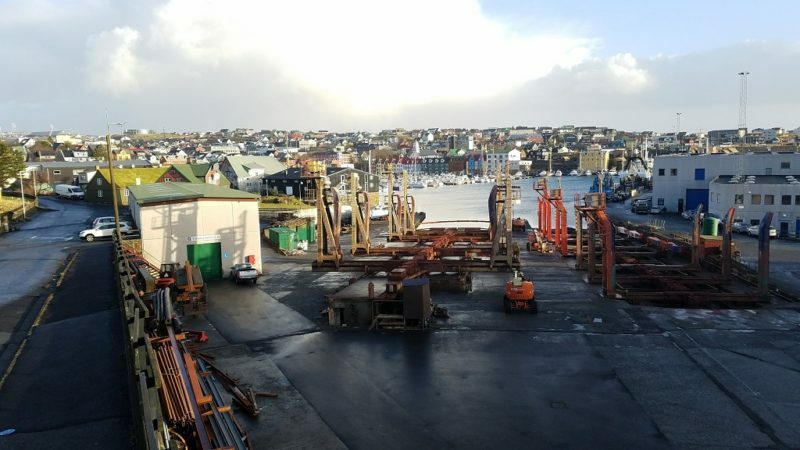 I went to Nólsoy, which can be seen from the harbor in Tórshavn, which is where you catch the ferry. 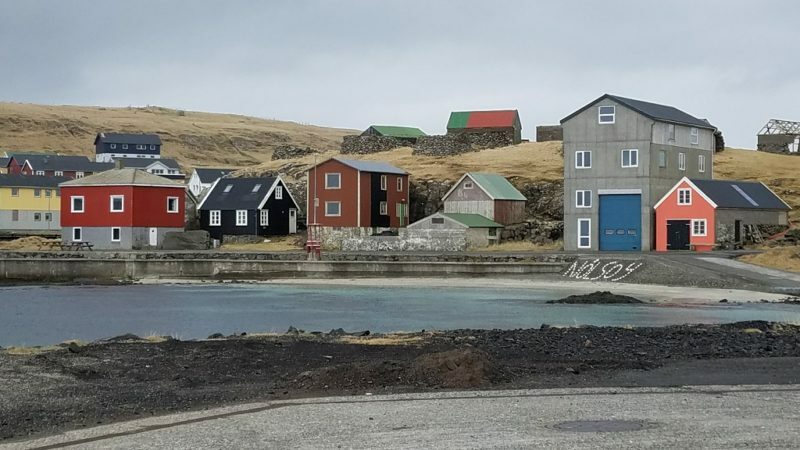 I actually saw Nólsoy every day when I walked out of my Airbnb. Each day it appeared different, as the clouds and time of day affected the mood. From reading the description of the island, I got the sense that it would evoke a feeling of my going back in time. This feeling was realized when I arrived and encountered a few people who spoke no English. A big contrast with Tórshavn, where everybody speaks English. I really had traveled back in time! I liked that the village has an official entrance to it, constructed from the jawbones of a sperm whale. And that it has a café named Maggies, even if it was not open when I was there. Maybe what attracted me to the village was reading about Nólsoy’s famous taxidermist. You can just knock on his door to ask to come inside his home to see his collection. That is just not something that you do in the States. Imagine an artists’ home where strangers just show up! I also appreciated that Nólsoy is a small enough island that you can trek across it to a lighthouse on the east side. And it is not any old lighthouse, but one that played an important role in WWII, as a decoy to the Germans. Part of the fun of the Nólsoy trip was chatting up the locals on the ferry. Hearing their perspectives as they pointed to a few new homes being built and their comments that the population was just exploding was interesting. The waters were choppy on the way back and I was laying down to minimize being seasick. I delightfully listened to a mother singing some sweet lullabies to her daughter. Not only did it calm her daughter, it calmed me as well. And I told her such before I got off the ferry. We exchanged knowing smiles. A day on a bus gives you several options. While the buses do get way beyond Streymoy, (LINK) it can take a bit of coordinating for connections and henceforth eat up too much time on a day trip. 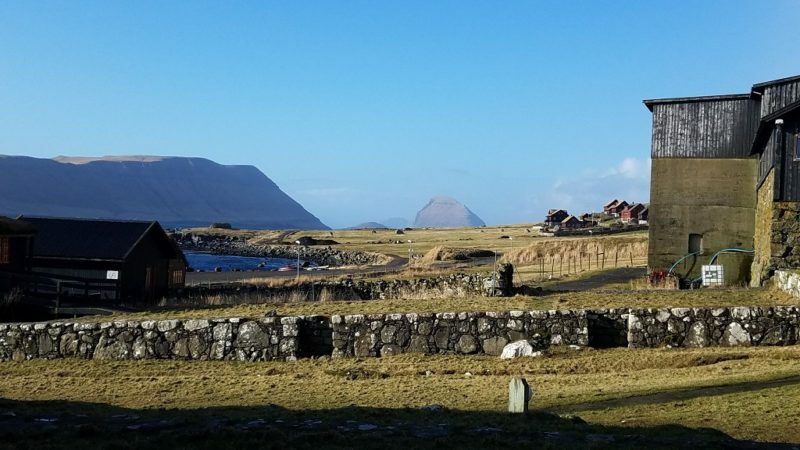 Yet Streymoy is the largest island and there is plenty to do on it. Heading north from Tórshavn, the main villages are Vestmanna and Kollafjorour. These villages have less than 1,000 people. I discovered many of the villages and towns I visited in the Faroes were similar in a lot of respects. With such a small population, I would not expect a lot of diversity. And it works to their advantage, as there is a dependable type of charm to be found anywhere you go. The villages are often built at the edge of a fjord. Somewhat protected, and, with a vantage point to look up and out at the surrounding mountains. A cool thing to do is catch a bus to a village, explore the village a bit and then hike a few miles, usually over some elevation. You will arrive in another village at a base of another fjord. You almost feel like you left one world and reentered another one. But, at the same time, the new one gives you a feeling of déjà vu. And the best part is that you can catch a bus from the second village back to Tórshavn. Honestly, for such a remote place, the bus system is highly advanced. Light years beyond public transportation in the States! When I explored in this way, I saw very few people. Things may be different in the summer. But the feeling of climbing to a high point and having spectacular panoramic views was magical. When I wanted to be, I was amongst nothing but sheep. And when I wanted to rejoin civilization, I just came back to the village. I spent my bus day getting to Kirkjubour, a very, very small village south east of Tórshavn. It was a 30-minute bus ride. There are no accommodations or amenities, so it truly is perfect for half a day self-guided tour. Make sure to check the bus schedule so you can get back. Kirkjubour has its own cathedral and farmhouse and church. The cathedral actually had roots in gothic times and was built in the 1200’s. The farmhouse was built in the 1100’s and is the oldest inhabited wooden house in all of Europe. Now we are talking some history! The church is well preserved and in current use. I spoke to a local there and she said in the summer, people come over from Tórshavn and get married at the church. The backdrop of other islands is nothing short of exquisite. The mountains are steep, and it looks like they have been carved out by volcanoes, glaciers, wind and time. Something I found striking was that the new construction was done in the same style of the old construction. I really appreciated how the Faroese people valued keeping with tradition. There was a sense of uniformity, without being cookie cutter. 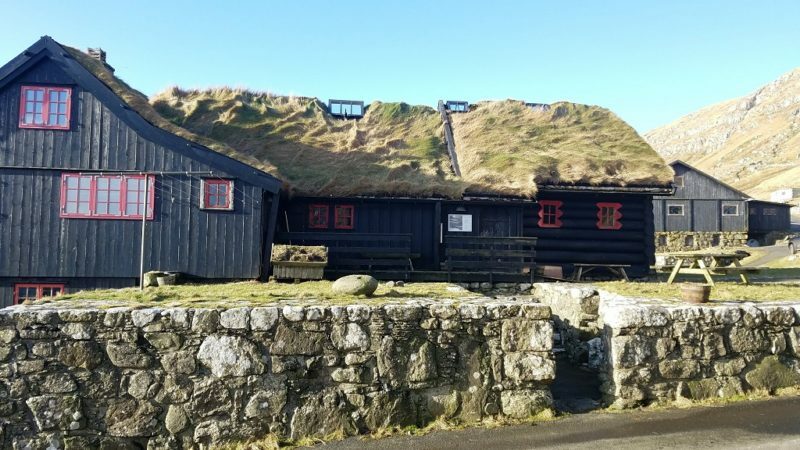 The sod roofs are totally adorable. Even if their origin serves a practical purpose, to insulate the home. On the bus ride back, a busload of children got on at one stop, seemingly in the middle of nowhere. It turned out to be one of three private schools in the Faroes. The kids were all confident in getting on and off on their own. At an age much younger than you would see kids taking buses alone in the States. This reflected what a safe place they live in. I had originally planned on only using public transportation in the Faroes. But as I researched, I realized that it was not practical to get there and back to some villages in one winter day. The bus connections were going to eat up a lot of precious daylight hours. Tórshavn has an Avis, which meant I could just pick up a car for day there and not be tied to getting it at the airport, which is on a different island altogether. In theory, you can hit any island that has a road, tunnel or ferry to get to it with a car. 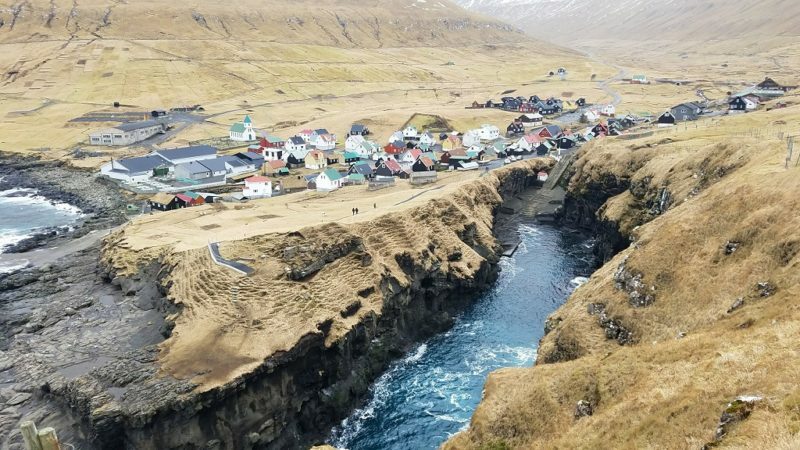 And if you have several days to explore, then traveling to the northern island of Bordoy and making Klaksvik your base would open more possibilities. In fact, there are six islands in the north and they are very remote, even by Faroese standards. 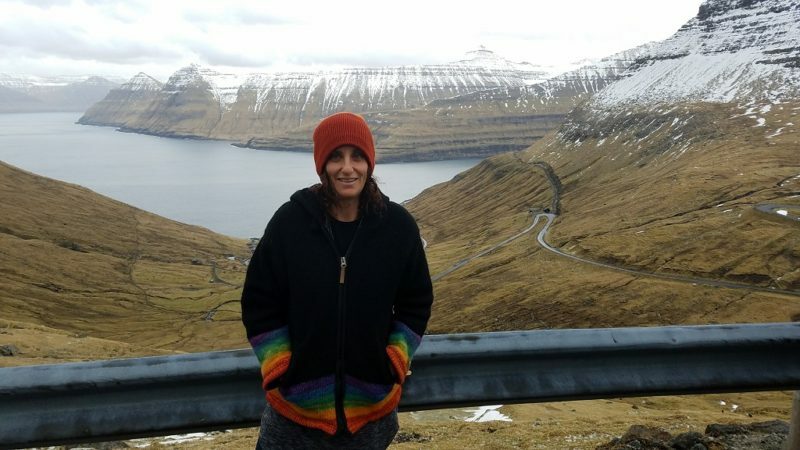 Should I have occasion to go back to the Faroes, I would make Klaksvik home and tromp around, just the sheep and I.
I set my sights on Gjógv, because I read it was one of the prettiest villages to visit. 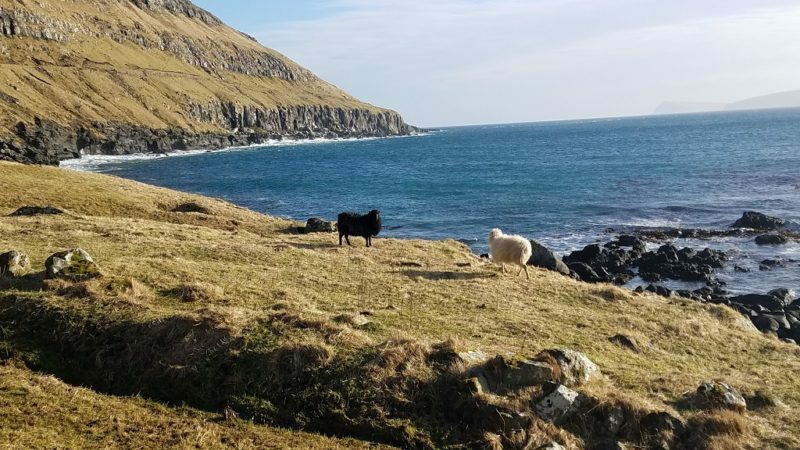 In truth, everything is adorable in the Faroes, so you cannot go wrong. Yet, Gjógv is nestled on the open waters and the continuous and omnipresent sea adds to the drama. But let me say one of the finest aspects of the day was the actual driving. Except on the really steep, rainy parts that were only wide enough for one car but intended as a two-lane road. After leaving Tórshavn and heading north up the coast of Streymoy, you will be hugging three fjords. I totally lost sense of where exactly I was. 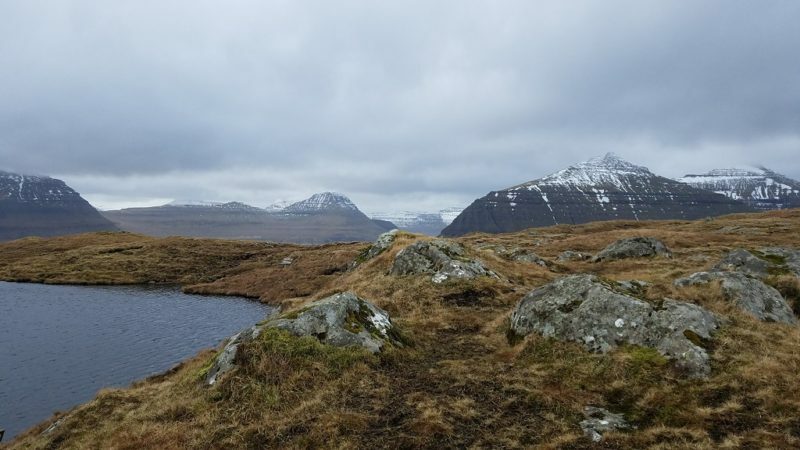 Was I looking across a fjord at another part of the same island, or had the fjord cut through the land completely in the last ice age to create another island? So, take your time driving and feel free to pull over for pictures or deep breathing or appreciation anytime you can. This really is one of the most remote places you will likely visit. Halfway to Gjógv you will go through a tunnel and emerge on the island of Estoroy. You cross the island and head north to follow Funningsfjord. The fjord ends at the village of Finningur and then you start the ascent. Those gorgeous pyramid shaped mountains sprinkled with snow that you formerly wondered about from sea level? Well, you have a chance to get up close and personal with them. The road is narrow and it’s slow going. And even from inside the car, I felt the temperature drop. Suddenly you are at the top of the Faroese world. The descent brings you from the snow line back to sea level, and eventually into this quiet village, where walking on the bluff, admiring the church and cemetery with excellent signage, and breathing the intoxicatingly fresh air are the best ways to pass the time. In the summer, the guesthouse hosts a cultural evening. And I bet the very cute coffee shop that does not open to June serves a mean cup of coffee. Although I was not willing to wait five months to find out for myself. Other than a few other cars of tourists, I did not even see anyone while I was in Gjóvg! The homes are well kept though, and I suspect people were just hunkering down. From Gjóvg, I carried on to Klaksvik, on the island of Bordoy. The outpost for all the people living north and east of Streymoy. I backtracked a bit the way I came to Funnigsfjord, and then headed south and east to Nordragota. You will drive by lots of villages on the way and see signs for others at turn offs. Since they are all similar, you need not stop at every one. But do pick one or two to amble through. I ambled around Nordragota. The town had a most interesting sculpture, where the statue was standing up, but on its side. Made me wonder how this came to be. Also, I noticed the villages all have soccer fields. I know much of the world is gaga about soccer. 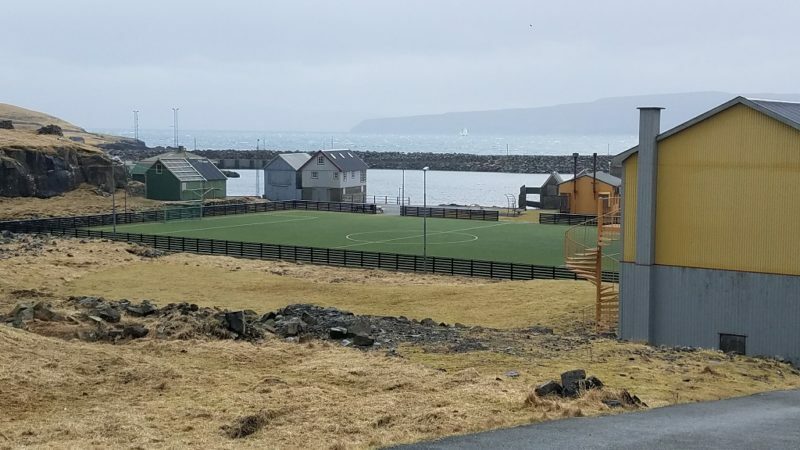 Yet, it did come as a surprise that villages with just 200 people, made sure to have a fully functional soccer field, complete with Astroturf. And lest I forget, I should mention the aquaculture you will see here, there and most everywhere. Fishing always has been a huge part of the Faroese culture and economy. Open ocean fishing can leave a country vulnerable. One way to stabilize the economy without much disruption, is through a shift to aquaculture. The fish rings look small from far away, yet when I got close, I realized they are about 30 feet in diameter. That’s room for a lot of salmon! Aquaculture, like anything else can be controversial. 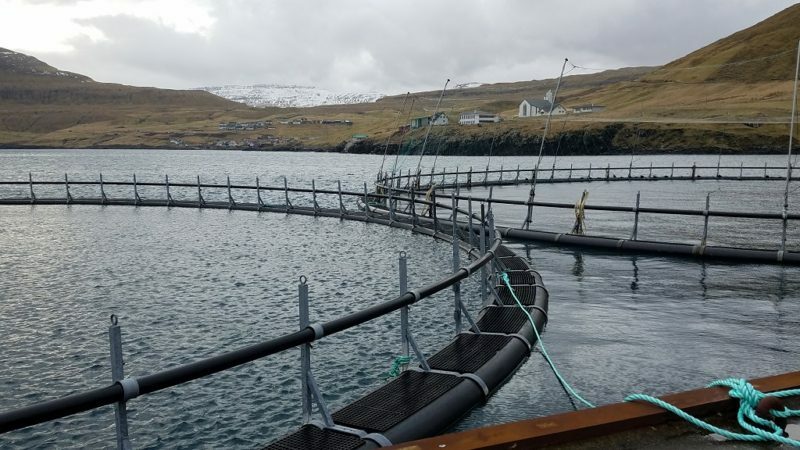 Although it’s clear that the Faroes are greatly benefitting from it at the moment. It was a day my mom would have called “windy, nippy, chilly.” So, the first thing I looked for in Klaksvik was a coffee shop. And Frida was just what the doctor ordered. I made myself at home in the comfy nook and took my sweet time to absorb the scene. I was sure everyone here knew everyone else. Clearly, it was the place in town where the locals gathered. On a walk through the town I saw another sideways statue. So, at this point, I had to know what was going on. I made my way to the visitor center. Firstly, they knew of Portland, Oregon. 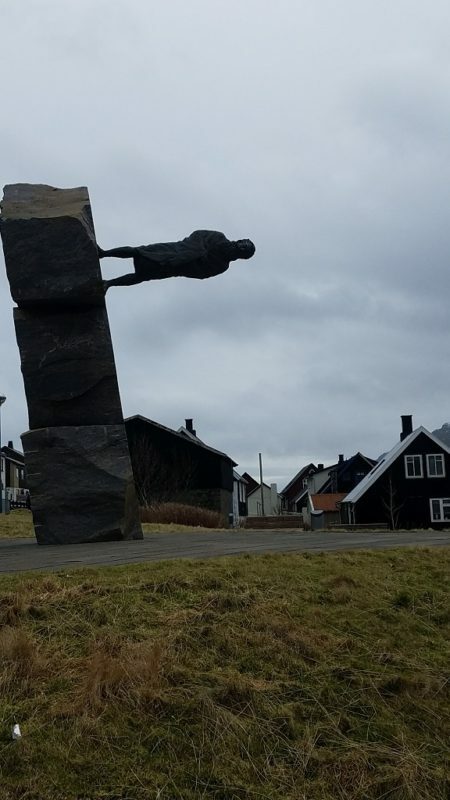 Second, they told me the sideways statues are just the artistic expression of the sculptor, nothing inherent in Faroese culture. Lastly, they directed me to where to start the hike I read about in the Bradt book. So off I went, with a mission to ascend the slopes that I knew would afford me a spectacular panoramic view. And I was right, it was spectacular. Check out the view I had! At some point, the trail faded and so I just made my own route. 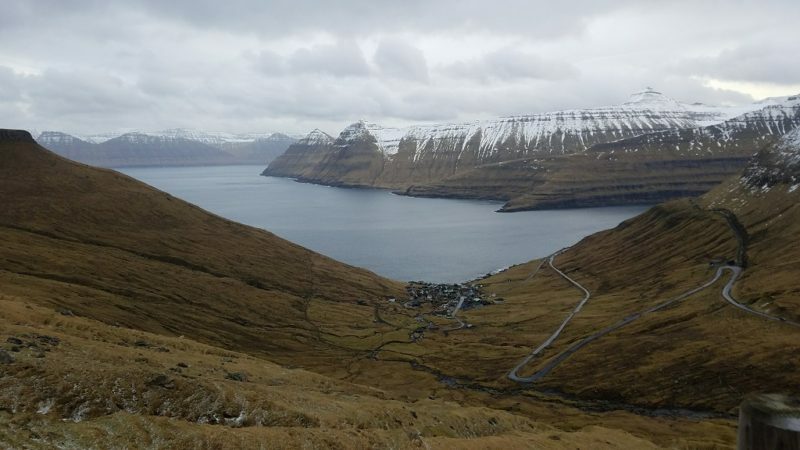 Looking down at Klaksvik, I saw how just a small strip of land separated it from another fjord. Which is to say, back in the ice age, the land was close to being stripped away, creating yet another island. Some of the geography is hard to understand in concept. But when you are there seeing it, it all makes sense. On the other side, I could see no sign of humans. Just grass, clinging on to the rocky hillsides. Although when I squinted long and hard, I also saw some sheep dotting the hillside. Everything is relative. So, saying Tórshavn is the thriving metropolis of the Faroes is a fact. Compared with the rest of the islands. For perspective, it has 20,000 inhabitants. It’s totally cute. And in some ways, life there just felt too good to be true. There is virtually no crime. People don’t bother to lock their doors or cars. The homeless problem pervasive in the States ceases to exist. The standard of living is high. The GDP per capita is about 80% of what it is in the States. Everyone has free medical insurance and access to free college. A traffic jam means waiting a couple cycles at a traffic light. Tórshavn oozes Scandinavian charm. It truly does. The homes are cheerful. 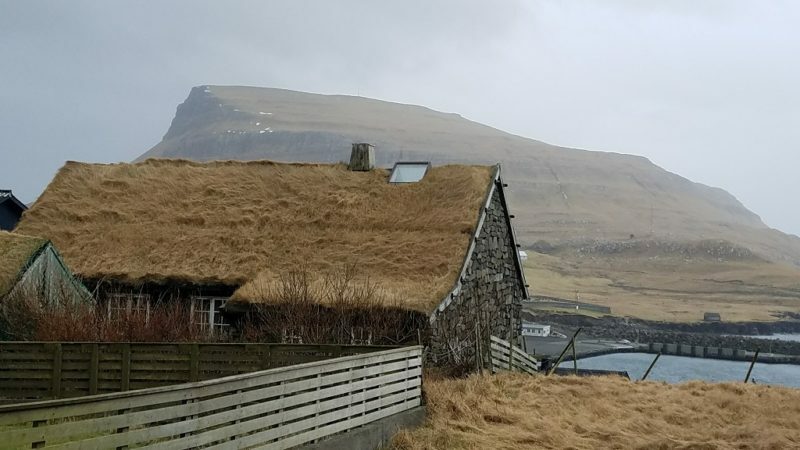 Some look like hobbit homes and are insulated with sod roofs. The shops feature local wares such as wool sweaters. The harbor is full of boats of all different shapes and sizes. By far, most of the boats were modest personal fishing boats. Yet the giant ferry and tremendous freighter did not seem out of place. In fact, I appreciated and understood how the Faroes are a hub for commerce in the North Atlantic. Exploring the old town and harbor is a must do. Shops and restaurants are most prolific here. The narrow roads are windy and, if I got disoriented, I would just look downward toward the harbor for perspective. Tiganes is close to the harbor and is a walk-through Hansel and Gretel. But believe it or not, these hobbit homes are the seats of Faroese government. I met a man standing outside and asked what he did. He was the equivalent of the head of the EPA and the Department of Transportation. I found this funny! There are specific things you may want to see as you stroll. Skansin Fort, The King’s Monument, The Nordic House and Vesturkirkja Church. There are other museums to visit and an aquarium. Winter hours may be limited, so do check before you go. 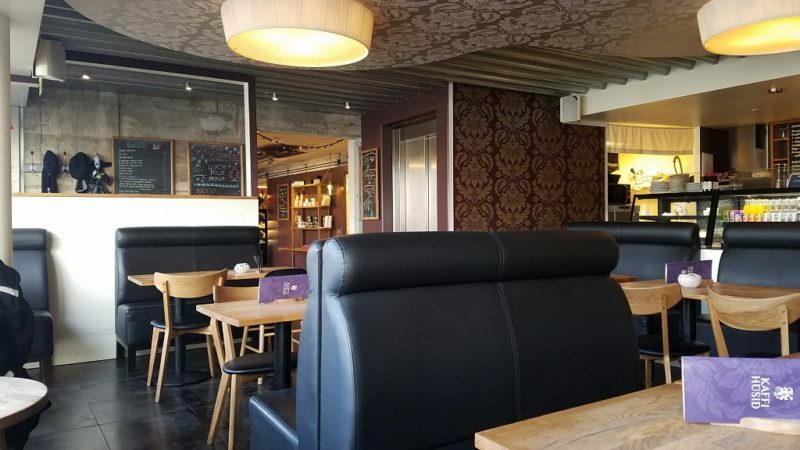 I did a lot of my own cooking in Tórshavn, but I’ll share a few eateries I went to that were fun. Kaffihusid on the harbor is great for your morning coffee and biscotti. Hvonn is a pub in Hotel Tórshavn that features live music. Why not have a dessert and coffee while you are there. Etika is a sushi place. The service was slow beyond measure, although when the food finally arrived, it was tasty. Go there if you like sushi and are in no rush. Tarv is a new tapas style Spanish Faroese restaurant. I lucked out by getting the royal treatment while I was there. The food was fresh and tasty, so I would not hesitate to go, even without them rolling the red carpet out for me. Áarstova and Koks were booked while I was in town but are well respected and probably the finest food in the Faroes. Áarstova and Koks. The latter having a Michelin star. I did not visit the Mykines but want to mention them. 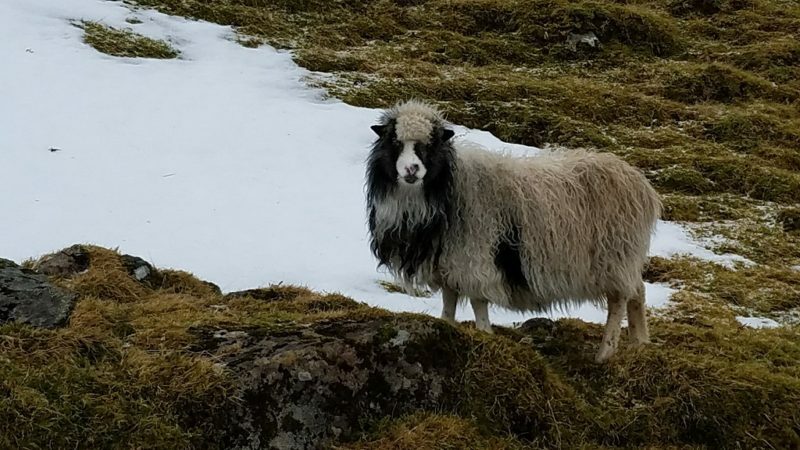 They are reputed to be the pinnacle of Faroese beauty, the most scenic of the islands. And the hillsides of puffins are a sight to behold. However, the weather and transportation to the Mykines is unpredictable. It is possible to get there, and a storm rolls in. The ferry and/or helicopter service could be delayed by several days. The takeaway is – go to the Mykines if you are in the Faroes for more than a few days. Or a day trip in the summer, if the forecast looks promising. A few days in the Faroes may be just what the doctor ordered. The key is exploring in a leisurely pace. You can mix and match how you access the eighteen islands and villages. This will ensure you make the most of your 3 magical days in the Faroe Islands.